Pure water system that doesn’t use chemicals to clean your windows. Instead, we tap into reverse osmosis and delonization to bring pure, mineral-free water to your windows. The result is a completely spot and streak free surface for all of your panes. Chemical-free results thanks to our pure water system. This safe alternative to traditional chemical-heavy window cleaning methods is safer and more effective. You’ll also have the peace of mind that contaminants are never seeping into your groundwater or landscaping throughout our cleaning process. Water-fed pole system that can successfully clean windows up to four stories. This means that we can bring unbeatable precision and stronger results to all of your windows… Whether they’re on the ground level or the top floor. We’re obsessed with getting you a streak-free result. 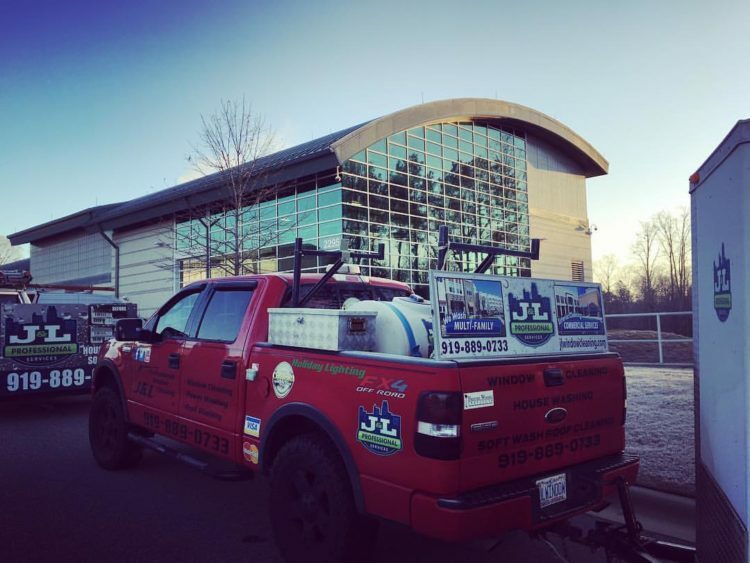 Our mobile window cleaning station taps into the best technology to get you the clean, spotless windows that your business deserves. We clean your panes until they’re complete buildup-free, then we focus on your tracks, grids, and frame. This comprehensive service means that you get a more complete result. Security: We’re insured up to $2,000,000 so you can dive into every project with confidence. Expertise: Our team has been bringing great results to windows for more than two decades. Simply put: We know what it takes to bring the best to you. Satisfaction Guaranteed: We put our all into delivering services that exceed expectations. If you aren’t satisfied, we will do everything that we can to make it right. Give your commercial property a fresh outlook with clean windows. Get in touch with J&L for your free estimate!